This weekend was a first, in that I had vegan for dinner on both nights. While I’m not a vegetarian or a vegan, I have been trending towards eating less meat for a number of years now. I suppose if I were to pigeonhole myself, I’d call myself a “flexitarian” who prefers to belong to the school of lacto-ovo vegetarianism whenever he dips his toe in the pond. I think that is a nice compromise. I don’t think I can ever become a full vegan, if only because I can’t see myself living without mayonnaise, cheese and butter. That being said, I remain open to the possibility. When I do cook with meat, I tend to use it as a flavoring than as a main event. I don’t want to fool any of my readers though; I can be quite a carnivore if I choose to. That being said, I think it’s interesting, that in pursuing a vegetable-focused, seasonal outlook towards cooking, I have to a large degree, wholly transformed my diet in the process without realizing it. 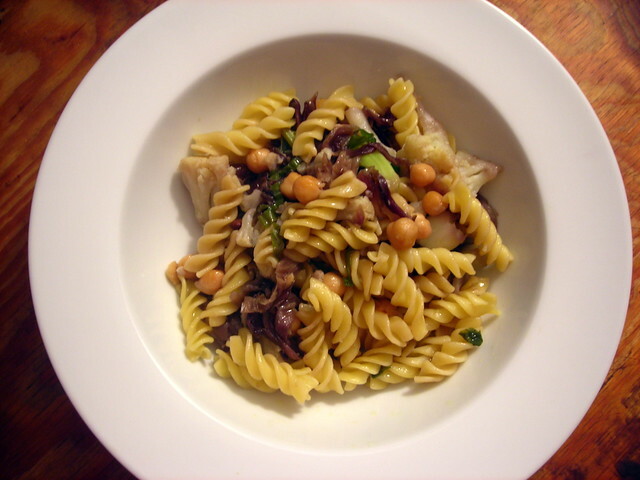 Fennel is such an underused vegetable. I’m surprised that people don’t cook with it more often. This is a vegan version of a classic salad that sometimes contains shavings of Parmigiano-Reggiano cheese. 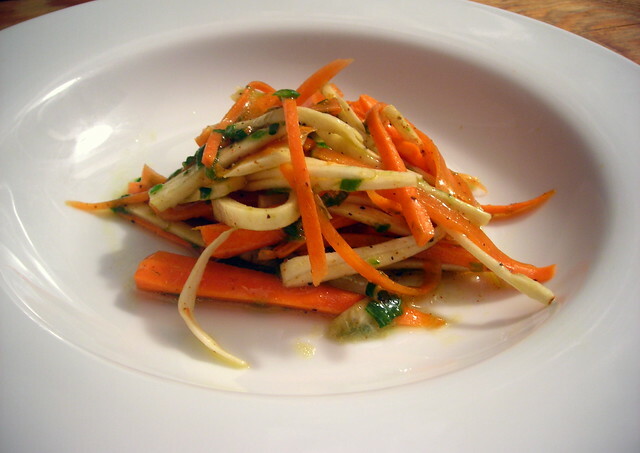 Italian salads are simple, and usually focused on two or three ingredients. You taste more, with less. Traditionally, you would use white beans for this dish. This version contains chickpeas and Rancho Gordo Sangre de Toro heirloom beans on a toasted baguette, along with slow-cooked onion, watercress, preserved lemon and garlic. The pickling liquid in this case is a cup of white wine vinegar with a teaspoon of sea salt and a tablespoon of sugar. Bring that to a boil, then add thinly sliced fennel. Cook for three minutes, then drain. Reserve the pickling brine for another use. 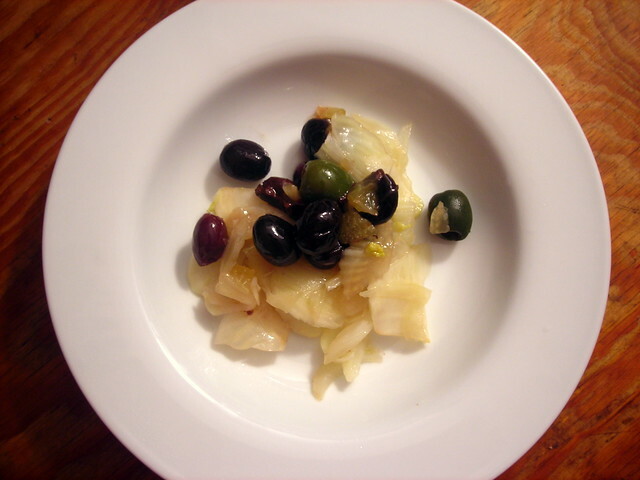 Combine the fennel with mixed olives, preserved lemon and olive oil. Let the mixture sit for 30 minutes to two hours before serving. The recipe is adapted from “Vedge“, by Rich Landau and Kate Jacoby. Besides fennel, you could pickle Chioggia beets, Jerusalem artichokes, turnips or kohlrabi. Imagine the possibilities. Lately, I’ve been experimenting with the technique of cooking pasta with vegetables by preparing it as you would a risotto. Begin by preparing dried pasta — bring a pot of lightly salted water to a boil, add the pasta and cook until the pasta is nearly done but not quite al dente. Meanwhile, blanch some cauliflower, broccoli or greens, then coarsely chop the vegetables and set aside. Warm some olive oil in a skillet, add some chopped garlic and the blanched vegetables. Cook the vegetables until they’re warmed through. Add the pasta to the skillet, along with a ladleful of pasta cooking water. The pasta will finish cooking in the pan, and the resulting sauce can be as brothy as you like. 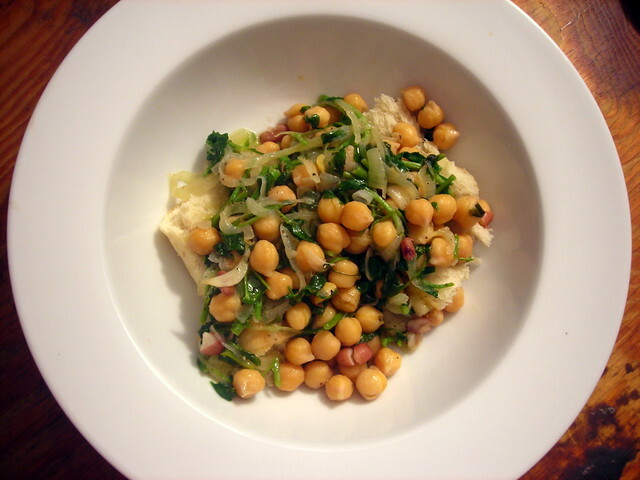 The version pictured above contains cauliflower, radicchio and chickpeas. I’m eager to try this technique in the summer, when zucchini, corn and tomatoes will be in abundance. 13 Jan	This entry was published on January 13, 2014 at 2:56 pm. It’s filed under food, food photography, recipe, vegan, vegetarian, winter and tagged cauliflower, fennel, food photography, meatless, radicchio, seasonal, vegan, vegetarian, winter. Bookmark the permalink. Follow any comments here with the RSS feed for this post. I love fennel. Thanks for highlighting a recipe that uses it in a new way! I always either braise or saute mine. That salad looks so refreshing and bright! You’ll be seeing it in a couple more things later this week. Those all look delicious! 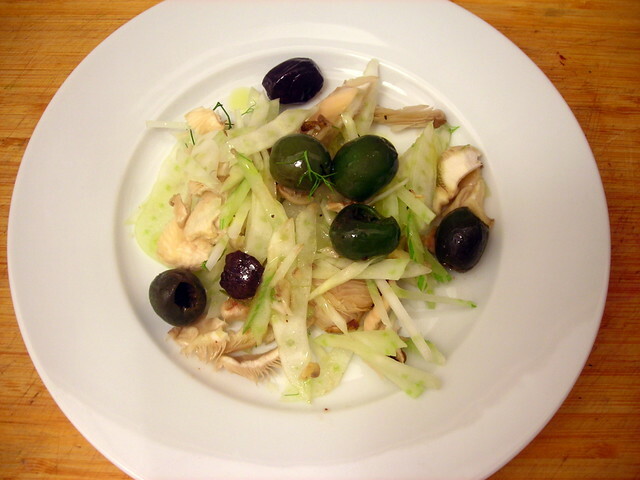 You have inspired me to bring some pickled fennel into future dishes.